Do you know that toothbrushes do create a lot of waste every single day? Indeed, approximately 50 million pounds of them are tossed into America's landfills itself each year, not included other countries. If you follow the dentist's recommendation and replaced our toothbrushes every 3 months, we'd be throwing even more of them away. Fortunately, nowadays there are some eco-friendly alternatives which are available in the market, either you can get them at any retailer stores or online websites. 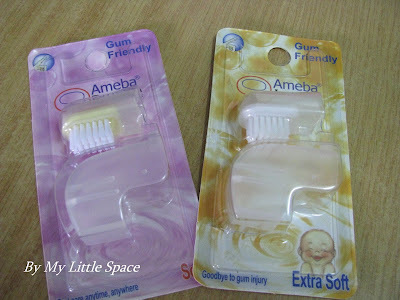 And today I'm going to introduce you to one of those environmental friendly product and also gum friendly product which is quite new in the market. 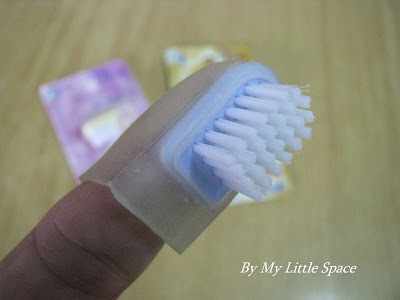 You can find out more at http://www.ameba.com.my .It's a true bristle fingertip product which is suitable for all stages. Brushes without a handle = less waste! We use our fingers as a handle instead. Is that anything wrong??? SO, these are the products I'm going to giveaway on the voting game. Stay tuned! 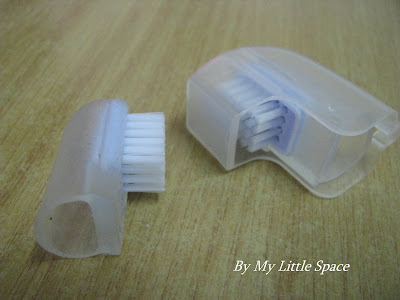 There are a few fingertip products in the market but they don't provide true bristle. Those are normally made of silicon and it's too soft for the adults, or they may juz meant to be used on toddlers only. What you see here in this picture, yes, it's a true bristle fingertip brush and it's wholly covered by soft plastic cover to lock to our fingers! One size fits all and it can also protect our gum from being knock to bleed. I wonder have you came across this product before! The package came together with a brush protector or cover. And not to forget to inform you! The brush cover can be locked to your key chain as well. 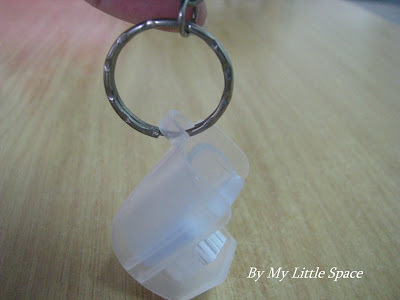 So convenient for travelling or champing trip. 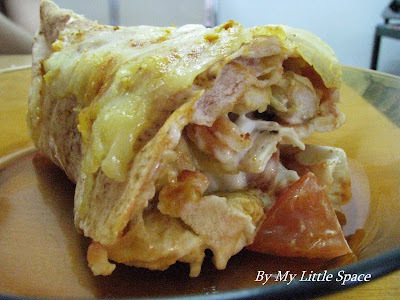 This my previous posting STROMBOLI, ENCHILADA OR BURRITO!!! -very simple if you're not a follower then please click to follow my blog. -then make the vote at my comment box which number are you voting for(one vote per entry, you can make as many as you want, maximum 3 votes). -the participants are allow to vote for themselves as well (but only one entry is allowed). -the most votes will win the giveaway, and the person who vote for the winner also win the giveaway(by lucky draw). - the voting game end on the 30/10/09, announcement make on the 1/11/09. *Hope you all will enjoy yourself and you may start voting now. Have fun! I vote for number 11 STROMENCHIRITO. I vote for STROMENCHIRITO number 11. 1 too...although isn't this more a Stromchilada (cuz no rice...?) Love it!! I vote for #6, Lebanese Enchurito - the name says it all!! I'm going with #6! Go Lebanese Enchurito! I love all the choices, but I'm leaning with #6, 10, and 15. I've never seen those little toothbrushes before! Kind of funny! But a great idea! I like #3! My vote goes to NUmber 4! These toothbrushes are brilliant! Thanks for the votes! Make sure you click to follow my blog to make the vote valid lol!!! Thank you very much & keep voting. Great giveaway!! Glad you went for it :o) It was my pleasure to give you the blog award. Have a great weekend... cheers! My entry is number 11 STROMENCHURRITO. PLEASE CHANGE THE SPELLING TO STROMENCHURRITO. I AM VOTING FOR number 11 STROMENCHURRITO. Those eco toothbrushes look like the one I use on my pup! I would love to have one of my own to use when I'm away from the house. Great post! Ok, I vote for #10 since it rolls off the tongue. ;) I would love to tell people I'm eating a "Chiladarito". Good luck! I wish you had links so I could see all the entries and judge them on something other than their name. But since that's the only thing to go on I have got to go with #4. I'm always intrigued by something called "Monster". I drive 200km here in BC just to have a Monster Burger and it's always worth the trip so why not a Monster Burrito melt. It sounds great. Oh darn Kristy, I forgot to email you a name I came up, lol!! I was thinking about Strombolada. hehe!! Love this giveaway! !